Fred Wacker, Jr. served in the Navy during WWII. After his discharge he returned to Chicago to commence his career in the family business – Ammco Tools, a supplier of tooling equipment for auto manufacturers. One of the fringe benefits included a company car - in this case a gray Pontiac 4-door sedan, which he despised. He soon decided to risk his father’s wrath by trading it for an MG TC. One of his first trips in the TC was to attend the Indy 500, where he met up with some guys from the east coast, and was introduced to the fledgling Sports Car Club of America. This led to Fred’s role in establishing the Chicago chapter of the SCCA, and his entering the stripped down and mildly modified TC at Watkins Glen in the fall of ’49. The MG sported “8” as the racing number – the same number of his father’s racing yacht. Fred’s maiden voyage in the field of sports car racing got him a 3rd in class finish, and gave him a chance to make a lot of contacts. 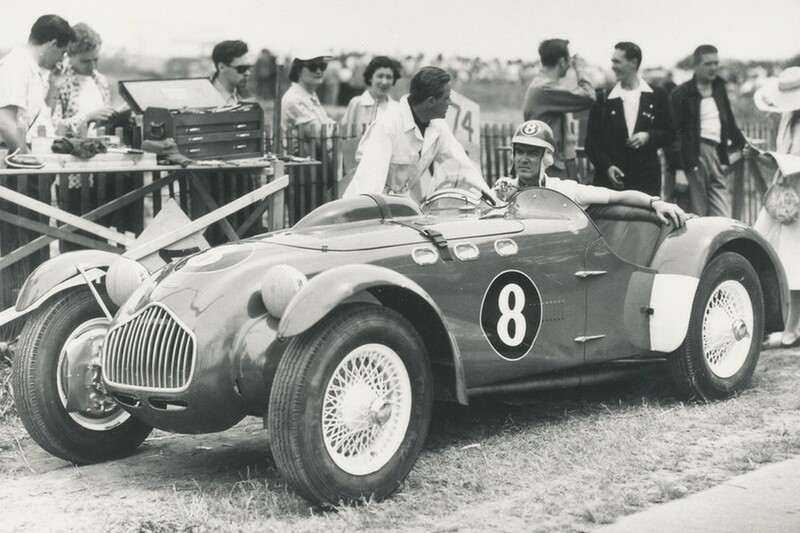 He was racing a Healey Silverstone at Bridgehampton in 1950 when Tommy Cole introduced him to the Allards. Fred decided to go that route, ordered #1577 and commenced work with Frank Burrell to install Cad power in front of a highly modified Hydramatic. Fred likewise gave this car the number “8” which, with the artistic touch of Karl Brocken, morphed into the iconic “8-Ball” roundel. Fred drove his Allard to a 3rd place finish at Watkins Glen in 1950, and then on to Florida for the inaugural Sebring 6 hour race. He and Frank Burrell finished two laps ahead of the field, but officially finished in 8th spot behind the ‘index of performance’ winner – a .724 liter, 27 horsepower Crosley Hotshot. Fred, along with several other SCCA racers, then accepted the invitation from Argentine strongman Juan Peron for an all-expense-paid trip to Buenos Aires to run their cars in the Sports Car Olympics in March 1951. Fred finished 2nd, just behind John Fitch, before accepting an offer to sell his Allard. However international political issues arose with the sale of #1577, so it was shipped back to the US. Emil Loeffler had the car restored about ten years ago – and displayed it at the Allard gathering in New Jersey in 2009, and at Watkins Glen in 2010. Fred Wacker had already bought his second Allard J2 #2086 in 1951 before the Argentine sale complications arose, but did not have any problem re-selling 1577 once it got back to the US. He likewise fitted his new Allard with Cad power and a Burrell-modified Hydramatic – along with several other performance and handling enhancements. #2086 is the Allard J2 involved in the tragic Watkins Glen accident in September 1952 that essentially brought an end to racing on public roads in the US. Fred continued to race #2086 through 1954. The car since passed through several hands before Paul Brownell of Milwaukee WI purchased it in 1986. Paul stored it in the garage behind his home for several years before deciding to go the ‘preservation’ route. About 6 years ago he gave it a rather comprehensive mechanical restoration, and had taken it to a number of local car shows – including Elkhart Lake. Paul Brownell has since passed away, and this car remains in the Brownell family. Late Allard Register publisher, and renowned Allard ambassador Dr. Tom Turner, raced his immaculate Ford flathead-powered Allard J2 #1575 under the “8-Ball” moniker (with Paul Brownell’s permission) for several years until his passing in 1994. Tom’s widow, Yvonne, subsequently went to racing school and continued to vintage race this J2 for the next couple years before selling it the Rick Cole Auction in Monterey. The car now resides in Europe. Bob Lucurell owned and raced #3161, his red Hemi-powered J2X for the past several years. That car also displays the “8-Ball” moniker (with Fred Wacker’s blessings). Lucurell sold this car at Bonham’s Auction within the past year. The following story comes to us from Alan London, who's father worked at the Essex Aero Ltd., builders of a very unique Allard Special. After that is a brief story about the Essex Coupe from an old AOC newsletter and finally a note from a previous owner. That’s a question I’ve recently posed, in person and by email, to folks on both sides of the Atlantic. Perhaps surprisingly, especially to us Jag-nuts, the responses have leaned predominantly toward the side of: ‘TWO’! True, the two cars do indeed share the sleek, classical lines indicative of the early nineteen-fifties, but there, the similarities end. Behind the question lies a story, in the main untold – so without further ado, let’s travel back through several decades, to the mid nineteen-thirties. Essex Aero Ltd, was founded by Reginald (Jack) Cross, with the assistance of my father Lionel (Jack) London. In 1937 their firm, which in the early years specialized in the manufacture/repair/modification of aircraft components, relocated from Marylands Aerodrome, Romford, Essex (hence the company’s name) to the Gravesend Airport in Kent, when the Percival Aircraft company vacated the premises. In their new location, Essex Aero was responsible for servicing local, private aircraft, plus those operated by the airport-based Flying Training School. In addition, it began experimenting with Magnesium Alloy and utilized the metal in some of their products. The opening in 1938 of the Royal Air Force Elementary Reserve Flying Training School provided the company with additional maintenance assignments. With World War Two looming, the airport was sequestered in 1939 by the Air Ministry, and designated a satellite station of RAF Biggin Hill, which had been assigned the task of defending London and the South East. Gravesend’s proximity to the English Channel made the airfield an ideal candidate for Biggin Hill support. During the Battle of Britain period, the airport was home to squadrons of Blenheims, Spitfires, and Hurricanes, which were serviced by Essex Aero, and repaired as necessary, on mission return. Throughout the years of conflict, my father’s company, in tandem with its war-service, continued to hone its knowledge of Magnesium Alloy. So much so that on conclusion of the war, when the Allied countries created a ‘team’ to compile not only the ‘lessons learned’, but to also examine German technological advancements. Essex Aero were asked to represent the Magnesium Alloy community at the team’s subsequent conferences/conventions. The company had swiftly established a reputation as a world-wide leader in M.A. technology, with its representatives frequently being invited to deliver lectures on the subject. Although still contracted to the Air Ministry, the post-war years saw Essex Aero rapidly expand its workforce and its range of business, moving into the commercial world. It began producing a variety of M.A. items such as lightweight hospital beds, fold-up chairs, and soft drink, beer, and milk crates. Their star truly shone, as was evidenced by the giant Essex Aero four-point star, fabricated solely from Magnesium Alloy. Captured in the beams of three powerful spotlights, the star was suspended over London’s Northumberland Street, and became a focal point of the 1951 Festival of Britain celebrations. In 1952 Essex Aero designed and manufactured an all Magnesium Alloy-bodied Allard sports coupe. The body panels, each hand-formed, were welded together into a single-piece configuration. A standard Allard J2X chassis was lengthened to accommodate the sleek body; a shell so light, that, at a weight of around 140-pounds, it could be held aloft (at the point of center-of-gravity) in its entirety by a single man, and also, from each end, by two ladies – as is shown below in the photographs that were extracted from the Essex Aero archives. Attached by a mere six silent-block rubber mounting points, the body could be swiftly removed as one-piece, thereby exposing and providing access to the principal mechanical components for any necessary maintenance or repairs. ‘Dad’s Allard’ was powered by a 3,917 cc. Mercury V8 engine with a compression ratio of 8.1. Top speed was a reported 135 mph. The car featured a four-speed electric, pre-selector Cotal (French) gearbox, and thus no clutch was necessary. In line with company traditions, this beautiful, stylish machine was unflatteringly named: ‘MAGBODY’! My father’s friend and senior partner, Managing Director Jack Cross, whom both mum and dad would affectionately refer to as ‘the old man’, was the driver behind the project. Both he and my father shared a passionate belief that magnesium alloy would, given time, prove to be a far superior material than the fast-approaching soon-to-be rival, gaggle of plastics! Jack Cross was also the driver (and proud owner) behind the wheel of this truly unique vehicle which, incidentally, Sydney Allard, the founder of Allard Motor Cars, had taken an interest in, keenly following its progress from conception to completion. Jack could be frequently spotted buzzing around Kent’s narrow country lanes in his... new ‘baby’! Sadly, in early 1956, Martin’s Bank (later Barclays’s) placed Essex Aero into Receivership. All assets were swiftly disposed of, including the one-of-kind Allard, which was literally stolen for a mere 350 British pounds!!! Our family, with much-depleted belongings in tow, relocated, and alas, subsequent communications between Jack and Jack were reduced to mere telephone conversations. And so the car just kind of fell off the London’s landscape. But despite all, my father, who lived to just shy of one-hundred, never let up on his life-long love affair with that Allard, and also never ceased, most-like because of his son’s Jag-affections, to prod and insist that ‘the car that the two Jacks built’, in both of their minds, was designed and produced well afore Jag’s XK 140! Just recently, my wife Maureen, herself an owner-member of our Jag Club, whilst rummaging through some of my parent’s belongings, came across the original photos of the Allard. It was her idea that we, in memory of dad, and because the car represented such a proud episode in his life, leaf back through time’s pages, and endeavor to trace the route she had traveled from the 1956 sale to the present day, trusting to fate of course, that MAGBODY actually did indeed still exist! By chance, our continuing probe brought us into contact with Colin Warnes of the Allard Register. With his help, we were able to locate the MAGBODY’ shell. It is currently housed at Heritage Classics, a Middlesbrough (Teesside) car restoration company that, coincidentally, specializes in Jaguar renovations. I mentioned earlier that fortune had smiled, but…! I was able to make contact with John Collins, the founder and owner of Heritage Classics, and a super gentleman to boot. Understanding and appreciating the motives of our project, he immediately supplied me with a series of photographs, a few of which are shown, plus an update: As I’m sure you will understand, his information generated within Maureen, Colin, and myself, a rash of very mixed feelings. Sadness and a sense of dismay: that such an example of artistic expression and a long-obsolete skill, has been reduced to, by all appearances, a barely clinging-together collection of metallic leaf flakes. The buffet of one mighty wind gust, one fears, would scatter all in a thousand different directions! A muted joy: that what once was, still is – though barely! As John explained, the owner prior to the current, operated a trailer-manufacturing company in Aberdeen. Requiring additional space for his business operations, MAGBODY was moved into a field, where it remained for fifteen years. As John warned me, and is oh so plainly evident, the Mag Alloy material has deteriorated far beyond any possible repair. He has therefore been tasked by the current owner to replicate all of the panels in aluminum. As you can see, the task has already commenced, but at the time of my writing is in temporary abeyance. John has promised to keep me updated as the project again moves along. In our correspondence, I provided John with background material on Essex Aero and my father’s deep involvement in MAGBODY’s origins, (as discussed in this piece), and he intends forwarding it on to the current owner. Eventually, and with hope, between the three of us, it may be possible to color in some of those afore-mentioned historical gaps. For Maureen and I, there remain pages still to turn before the book on MAGBODY can be closed, but I hope that for fellow Jag-fans, the story so far is an interesting one. For us ardent enthusiasts, an emphatic “ONE” is the obvious answer to the question I initially posed. But, just for a moment, blank off the signature Allard grill and…maybe, just maybe, albeit tongue in cheek, my old dad had a point…you be the judge! This 2 plus 2 coupe was built on an extended Allard J2X chassis by Essex Aero Ltd, of Gravesend Airport in Kent, for R.J. Cross, managing director of the company, in l952. During the war years the firm made fuel tanks and other parts for de Havilland Mosquitos. Like the standard J2X the Aero's chassis, 2224, had a divided front axle with forward radius rods, deDion rear axle, coil springs, hydraulic dampers, 12-inch Lockheed brakes with Alfin drums and air scoops, and 16-inch wire wheels. Claimed to be the first car body built entirely of magnesium alloy (DTD 118A) the 16-gauge panels, 12-gauge pillars and supports achieved a remarkable saving in weight. The bare shell, without front seats and floor, but with doors, grille and luggage locker floor weighed only 140 lbs. Taken at the point of balance, a foot or so back from the screen pillars, the body could be held aloft by one man. The 20-gallon petrol tank weighed 15 ½ lbs., compared with 39 ½ lbs. in steel, and the front bumper was a mere 8 1bs. Torsion boxes ran beneath the door openings and argon arc welding was used throughout. Location on the chassis was by six high tensile steel bolts in Silentbloc rubber units which, in conjunction with plug-in electrical connections, allowed the body to be lifted off for any extended servicing to the running gear. A large bonnet gave access to the engine and radiator. The instrument panel, controls and front seats remained with the chassis when the body was lifted and so it was possible to test drive in stripped form. Even with full trim, spare wheel, radio and Clayton heater, the Aero was 6 lbs. lighter than the standard J2X with Chrysler engine. The black and grey Aero was first driven by a 3.9-litre Mercury V8 fitted with Ardun ohv heads. The gearbox was a four-speed electric Cotal. Mr. A E Freezer who had the car painted red, experienced some trouble with the Cotal, and later came a Chevrolet V8 and GMC automatic transmission. Hello and Happy New Year Colin, hope the following is of interest. I purchased the car in the early 1970s from Mr. Laurie Ferrari, he owned a few cars at various time and was known to other AOC members. The body color was a mustard yellow and the car was running with a small block Chevy and automatic. I believe it originally had a Ford Pilot engine with a Cotal preselect gearbox. I remember a photo of the car at Brands Hatch in the`60s when it was painted bright red. I ran the car for a while then fitted a 365in3 Chrysler Firepower hemi linked to a 4-speed manual from an Alvis speed 25. The hemi tended to overheat in traffic even with a refurbed radiator and twin electric fans. In spite of that I did compete at Goodwood sprint meetings, a club race at Silverstone and the Valence Hill climb (twice) all without success. The hemi was powerful but VERY heavy and I soon learnt NOT to lift off in a corner as the car would swop ends! I eventually removed the (very light) magnesium body stripped it and resprayed it in a Ford color, "diamond white", the chassis was stripped and painted silver and the interior was reupholstered with a cream-colored leather which had red piping. I refurbished the wooden dash and had the instruments overhauled as were the brakes which had Alfin drums with steel liners. I then fitted a 331in3 Caddy, but a change of personal and financial circumstances meant that I was unable to continue running the car and after storing it for a few years I sold it to friend and club member John Peskett who removed the body and shortened the chassis to that of a standard J2X. When the Magbody came off and the J2X chassis was revealed it was found that most of the standard under structure was still there, for instance the standard rear body hoop had merely been notched and laid back. This meant that it was easy to bring the chassis back to standard configuration base. Essentially by sorting the body hoops and reversing the lengthening process (merely cutting it on the additional welds and removing the extra box sections that had been added to lengthen it). The chassis was then given a 'standard' J2X body to bring it back to the configuration it would have been in had the chassis not been assigned to special purposes and continued through the build in the Allard Works . PKJ 412 although now a 'standard' J2X, the car pays homage its history by carrying a Essex Aero Ltd. logo on her side. The Kenyan M...and a gift for a father. We've said it before...the best thing about running this site is the people and stories that find us. The other day, we received an email from Nick Goodey who let us know that his father had owned an Allard back in Kenya in the mid 50's. His father David was in the RAF and the car was an M he bought from an Indian in Nairobi who said it was imported by a previous owner who intended to enter it in the Coronation Safari Rally (1953)*. The steering box was well worn and he “Obtained"a box off a LHD Ford V8 Pilot which, when fitted and the vertical drop arm re-positioned reversed the steering! David bought the car in 1957 in Nairobi and it was sold in early 1958 as he needed a saloon for longer trips on game photo shoots and adventures. Fast forward 60 years or so and son Nick wanted to get his dad David a gift to remember his old Allard. Being a bit of a craftsman, Nick created the wireframe sculpture below of his fathers old M. The sculpture is almost 18" long! We were so impressed with the wireframe so we asked Nick if he accepts commissions. Nick replied that he does, with the basic pricing around NZ$250, 200GBP, or US$285 and varies due to size and detail. If you are interested in discussing a commission with Nick, click here to email him. One of our favorite things about publishing this website are the interesting people that find their way here. We received an email the other day from Roy Walter who used to work at the coach builder Hilton Brothers. Hilton Brothers were responsible for building the saloon (P1) bodies. Below is a brief look at what life was like for those who built our cars. When I was in the forces it was an offence to keep a diary-I suppose it was in case of capture and the subsequent betrayal of serious secrets,-so I never got into the habit, and I've always regretted it. I have problems with dates, but I think I went to work for Hilton Brothers in early 1951. Panel Beaters were an elite bunch in those days, we were mostly head hunted. The factory was basic in terms of plant and facilities. The Coachbuilders or chippies (wood workers) as we called them were upstairs on the first floor where the offices were. One of the Hilton Bros was the boss up there and we seldom saw him. For that matter we didn't see the other brother much either. The Panel shop was run by a certain Bill Merritt. The completed wooden bodies came down to us in a large lift, and we "tinbashers" formed the aluminium panels. Two guys were responsible for the roof panels, which included the cant rails, the peak over the windscreen and the two panels forming the rear light. I usually took care of the sides over the rear wheels, the boot panels and surrounding bits. Another guy did the boot lid and both doors. All these panels had to be welded together, and during this time, the skeleton skin was supported, resting on the peak at the front and the boot at the back. When the whole thing was finished and tarted up, we all lifted the skin up manually and dropped it on to the wood body, where it was fixed on by panel pins under the body. Such sophistication! We used mostly 18swg aluminium sheet. We usually cut our own panels up from patterns hung up on the wall. Welding was done by the usual method, OXYGEN and Acetyline bottles. One of us held up the panels to be joined, the other one welded them. We didn’t work in pairs; we just called out for help when needed. The one pair that always worked together was the pair who did the roof panels. These were too big for one to handle on a wheel, so they travelled a bit backwards and forwards from one side to the other then back the other way until the panel had enough shape. Then they welded on the surrounding panels. Hilton Bros never had a power hammer-they frightened the life out of me anyway. We rarely used hammers at all. Mostly it was bashing them judiciously with mallets, bossing mallets and sandbags, then smoothing them out with the [English] wheel. The welding process distorted the panels, and we took care of that with a flipper in one hand and a handweight in the other. I think there were six of us altogether, not counting the old feller who was a wingmaker. He had been a pre-war wingmaker in the British motor industry, forever telling us how easy we had it. There were a number of other guys who worked on the same floor. They were "fixers." They secured the panels to the wood frames, secured the bonnets, boot lids and doors, plus windscreens. Then the bodies went back upstairs to have the trim installed. Yes, the chippies made the frames for us to work to, but we didn't often get to see them. I mentioned Bill Merritt before. He was the panel shop foreman, responsible for inspecting everything we made; a man with an eagle eye. When he wasn't inspecting, he would help out on the floor. A nice guy. Came from a long line of undertakers so he said, recounting with great gusto some of the gory details. All British factories had a tea break at 11:00am and usually 3:30pm. We didn’t have a luxury canteen .We kept some planks against the wall, formed a circle with some drums and that was our "canteen." Washing was even more basic; a bucket with cold water and a bar of soap! The toilet was a disgusting old urinal. Eventually, we became fed up with all these primitive conditions, and making no headway at all with Messrs Hilton, we went on strike! All we got was promises, but luckily I got an invitation to work at Hoopers on Rolls Royces later on in 1952. Same sort of money but much more civilized. Sadly none of the old coachbuilding firms exist anymore. Even the Rolls Royce bodies are made in Germany from pressings then tarted up before sending them over here. Hoopers was an entirely kettle of fish, in that everything was organized. The chassis came in with the customers name on the windscreen, and we tinbashers worked in gangs of five to a car. The gangleader was paid for the whole car and we divided that price by mutual agreement between us, which worked out quite well. Mostly we were doing Silver Clouds , sometimes the occasional Bentley. My contribution was doors, which was challenging because the wing shape ran right through the doors. There was no getting away with any slack. The inspector wore sugar bags when he worked, and I don't think I ever did a door without his chalk marks on it. I was there about eighteen months. I only left Hoopers after pressure from my father, who, whilst in his late seventies started a business making shopfittings. My brother, an artist designed the product and made all the tools for him and the business took off. So much so that the whole thing ran away with him. Unless he could find someone trustworthy to organize things while he was outselling it was going to fall apart. Within a year our turnover was a million pounds annually. I had ceased to be a panel beater and became a Company Director. My life story stops here. I only mentioned it because I needed a good reason to give up tinbashing! PS: I had a big disappointment some months ago. Driving on a local motorway in driving rain, I actually overtook an Allard saloon. I couldn’t make him understand my frantic hand signals. He probably thought I had an ulterior motive and I gave up in the end as I had to be elsewhere. The first Allard I had seen for sixty odd years too, and I wanted to tell him we were connected. Ah well. Ce Le Vie! Chassis #99/J/1731 fitted with Ford Pilot engine # 5338/26 was the first of 6 Allards imported to Australia, the car arrived in September 1950 to Rube Gardner’s order. Gardner was appointed the local concessionaire having travelled to the UK to do the deal with Allard himself early in 1950. Gardner’s premises were on the Princes Highway, Carlton, a southern Sydney suburb. 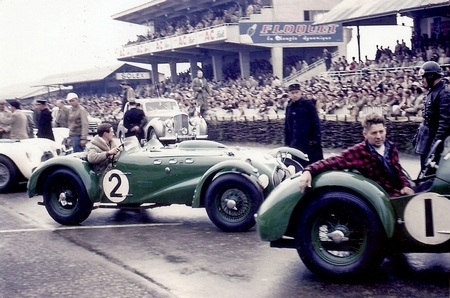 Gardner drove the car to the October 1950 Bathurst meeting. He didn’t race, but took it to Mount Panorama for display purposes. The red painted, side valve Ford Pilot engined car immediately impressed Stan Jones, the 1959 Gold Star and Australian Grand Prix Winner and father of 1980 World Champion Alan Jones. Jones first J2 competition event was the 1950 Australian Hillclimb Championship at Rob Roy in November, he finished 2nd in his class. In 1951 he raced the car successfully at Rob Roy, at Bathurst he was timed at 104.8mph on ConRod Straight, and at other meetings. Jones sold the car to Geelong, Victoria, driver Tom Hawkes in a deal which involved Jones taking over a Cooper MkV 500 Bill Patterson and Hawkes had raced in England in 1951. Hawkes raced the car in standard form for a while and then engaged Melbourne’s Ern Seeliger to modify it by fitment of an Ardun OHV engine kit and Jaguar 4 speed gearbox with ‘C Type’ ratios, to replace the 3 speed Ford Pilot ‘box. The tail of the Allard was replaced with a narrower one, the front and rear guards removed and wire wheels adapted to Lancia hubs fitted. The light car now developed circa 300bhp. It was a formidable, noisy and spectacular weapon at the time. Over the next couple of years the J2 competed widely, mainly driven by Hawkes but occasionally by Reg Robbins who maintained it. It was also driven by John Sawyer and Adrian Gundlach. The car raced at Fishermans Bend, in Albert Parks inaugural meeting in 1953 and Rob Roy, all in Victoria. Hawles competed at Collingrove Hillclimb, Sellicks Beach and Port Wakefield in South Australia. He travelled to New Zealand for the 1954 NZ Grand Prix meeting at Ardmore in January. There the car blew the OHV engine in practice, a stone pierced the radiator with the side valve engine fitted for the race, famously won by Stan Jones in the Maybach. The J2’s Ford engine was brittle and ‘popped’ comprehensively at least 3 times, twice with rod failure, the errant component carving the cast iron block in half on both occasions. The J2 was quick, it recorded 137 mph on Longfords ‘Flying Mile’ during the 1955 Tasmanian Trophy meeting. Hawkes advertised # 1731 for sale in October 1955 but continued to race it. The car was finally bought by Reg Robbins who had been preparing the car for Hawkes as noted above. He raced it at Phillip Island and Rob Roy in late 1956 and early 1957 respectively before sale to Geoff McHugh in Tasmania. Melbourne’s Ian McDonald repatriated it from a Tasmanian ‘chook shed’ in 1964, he restored it, a process which took 2 years. He first raced the car in an historic event at an open meeting at Sandown in 1966. The car has passed through numerous sets of caring hands since then and is still in Australia. Graham is the current caretaker of J2-1731. The car has been restored and is actively raced in Australia. The car retains Ford power, albeit with a set of ARDUN heads. The Internet has done amazing things for the car culture. Need help restoring a car? We now have access to vendors from around the world that can supply all the parts to restore and keep our cars running. Need to research the history of your car? No need to hire a Private Investigator; just go to the Internet! Looking for old photos of your car? Now you can easily find them online at the REVS Program, courtesy of Stanford University. Several notable photographers have donated their archives to REVS and rather than locking them away in a vault forever, the archivists are scanning those images and posting them online in a searchable image database! The database already contains several thousand photos, with at least a few hundred Allard's in there. We say at least because we've found a number of photos featuring Allards that haven't been tagged "Allard" yet. We even found a few photos of our J2X Le Mans racing at Moffett Field in 1953 (see above)! You can purchase any of the photos for a nominal fee, which helps to cover the costs of scanning the images, storage, web access, etc. If you've got some time to kill, click here to visit their digital archive. Sydney Allard was a survivor and visionary. After his company stopped building cars, they focused on selling performance car parts and...sun roofs. Why sun roofs? Today sun roofs are commonplace on cars, but back in the late 60's and early 70's they were a rarity. Allard was the UK distributor for Golde sun roofs, a German company that was the leader in this emerging industry. Click here to download the Allard Golde catalog. Special thanks to Kerry for sharing! 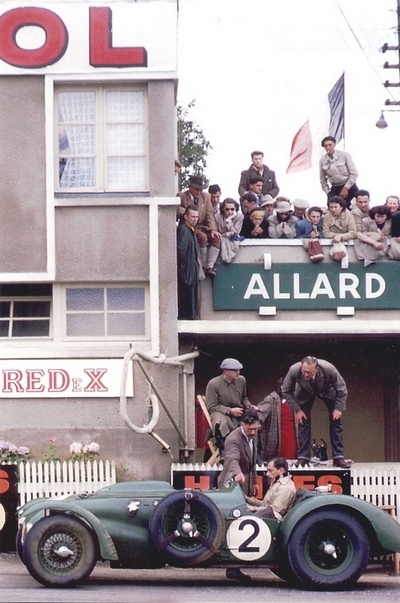 We are excited to share these recently unearthed photos from Le Mans in 1951. It's interesting to note the dramatic change between Le Mans in 1951 and what the race has become today. The #2 car of Alfred Hitchings & Peter Reece is featured prominently. The team crashed on lap 22, but managed to make the end of the race, finishing 214 laps. Unfortunately their last lap took more than 30 minutes, which disqualified the team. Who can you spot in the photos? From the August 12, 1957 issue of Sports Cars Illustrated magazine. Anyone know if this still exists? Special thanks to Kerry for sharing! We were excited to learn today that the British Pathe, who has been archiving world history on film since the 1890's...has posted their archives on YouTube. What does that mean for Allard fans? We get to enjoy at least a dozen or so Allard related films that we likely never seen before. Our favorite so far is this clip of the one-off Allard Dolphin. A car built on a L-type chassis that featured one of the earliest retractable hard top roofs. Loyal readers of the Register will recall that we published a story on the Dolphin back in 2009. Click here to learn more. Erwin Goldschmidt was probably one of our favorite Allard racers. Not only was he an outspoken supporter of the Allard marque, but he was extremely competitive. As early as June of 1951, Erwin realized that his 331 Cadillac powered J2 would soon lose out to Chrysler's new 331 Hemi. Desperate for more speed, Erwin wrote the following letter to the Cadillac Engineering Department in order to persuade them to share their latest speed secrets. Click the image below to view the complete letter and the response. Special thanks again to Barry Burrel for sharing another great find from his father Frank's archives. While perusing the SCCA "Sports Car" newsletters that were kindly shared by Andy Picariello of the AOC, I came across this interesting story about the Dam Rally. Apparently Sydney decided to debut his fiberglass Palm Beach prototype with the entrants at one of the check points. Apparently the car caused at least a few entrants to be delayed. Click here or the photo above to read the story. They are of #3147 on a visit back to friends during my senior year at Colgate University in 1953-4. The car was only months old when these photos were taken. As the car appears in these photos the spare tire was in the back hatch along with a foldable canvas top and half side curtains. The two little wind screens were stored back of the seats. I used the machine winter and summer and found the top quite effective in keeping one dry with the car moving but I put the half side curtains in a closet at home as they were far more trouble than worth as far as any useful effect when installed on the car." The report above is a vehicle test report from Zora Arkus Duntov regarding the Cadillac-Allard #952. Test car!? Allard!? Chevrolet!? It's no secret that the major car companies bought their competitors cars to test and dissect, but we think it's pretty cool that Chevrolet had an Allard as a test car. A few points of reference...this report was dated August 19, 1953 and the first Corvettes started rolling off the production line on June 30th of the same year. The first Corvette could hardly be called a true sports car, it was basically an underpowered sedan chassis wrapped in a sleek body. With the lack of comparable production sports cars from the competition, it makes sense that the bow tie would would want learn what made an Allard tick so they could make the Corvette better. So what car did Chevrolet acquire? We know they had access to Fred Warner's J2X, but that was an outright race car. After checking the database, we found that Chevrolet purchased K3 3171 from Vauxhall Motors USA (Vauxhaul Motors was acquired by GM in 1925). It makes sense that they would use the K3 as a test mule...convertable body, V8 engine, sporting suspension. Although we don't learn much about the car from the report, we do learn that with a fairly stock automatic transmission, the car could hit 0-60 in 8 seconds flat...not bad! It also sounds like they have some plans to tune the car to see what else it could do. Our records also indicate that Fred Warner ended up with the car and that it was raced. In case your curious, the car was light gray with a red interior and black top - and yes, the car still exists. -Click here or the image above to download the pdf. Special thanks to Barry Burrell for sharing this document! Few people realize the significant roll the Allard Motor Company had in General Motors. Sure many Allards shipped to the US were fitted with Cadillac engines, but they were also fitted with Chrysler, Lincoln, GMC, and of course Ford power. In 1952, Ed Cole was Chief Engineer at Chevrolet where he was tasked with developing the legendary small block V8. He was also friends with US General "Butch" Griswold, who was in command of the Third Air Force in the UK. Butch was a regular at the Allard plant and was good friends with Godfry Imhof. At that that time it was next to impossible to get anything imported into the UK, let alone a hot rodded American V8. That's where the saying, "It's not what you know, it's who you know," comes into play. Imhof wanted to upgrade his J2 and read about Fred Warner's J2X (pictured above) that had been equipped with a hot Cadillac engine that was serving as a Chevrolet test mule. So Imhof talked to Butch, and Butch talked to Cole. In the end, we don't know if Imhof ever got his engine, but if you read the letters below; you'll get to learn more about the "Warner" engine. Special thanks to Barry Burrell for sharing these letters. Barry's dad Frank, was General Foreman of the Cadillac Experimental Garage. 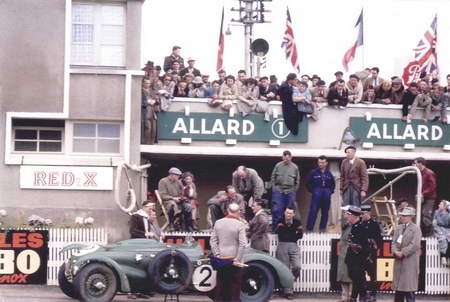 Frank also handled Fred Wackers Allard and was invited by Curtis LeMay to support the Allard team at the 1953 Le Mans. Every time the number fourteen Allard raced it always started on the pole as the fastest qualifier. I don't think I really appreciated just how important that really was until years later. Thinking about it I'm not sure how I really accomplished that. It didn't seem to matter where we raced, the car was just scary fast compared to other cars in the field. Being on the poll was always a little frightening because you have the entire field behind you, thousands and thousands of horsepower all screaming to go and if for some reason I stalled or some other stupid thing, it would be a terrible mess. I know that when I was in front and the starter would give us the signal to start your engines there was always that awful moment when you thought God I hope the battery isn't dead. After the engine roared to life I've probably put the car in 1st gear at least 5 or 6 times just to make sure I was really in 1st gear. Sometimes I would actually let the clutch out just a little bit to make doubly sure that I was in number 1 slot. Of course, that was only the beginning. My adrenal glands had probably been asleep for weeks or months since my last race and it was a rude awakening when the clutch came out and the car burst forward in a blinding explosion of speed. For some reason my vision immediately narrowed down to the front wheels and the road directly in front of me with little or no indication of what might be in my periphery. I don't think I was really aware of who was chasing me until at least the 2nd or 3rd corner had been negotiated without any serious mishap. Finally, I probably took a deep breath or let one out that I had been holding since the start of the race, and took a look to see who was back there. It was no surprise when it was usually Phil Hill. I've never really had a chance to talk to other drivers about what it's like to sit in front and lead a race from pole to pole or from start to finish. The pressure which is enormous at the beginning of the race gradually diminishes as you complete each lap without serious actions bordering on dumb. There were moments when only you and no one else realizes that you had probably made a very small error and you simply told yourself don't even think about doing that again. It might have been experimenting with a slightly different line on a corner or changing the breakpoint for slow down by 5 or 10 feet. You quickly learn that the once you're in front this is not a good time or a place to experiment with how to go faster. After all, you're in front, what more do you want, all you have to do is stay there and everything should work out to your satisfaction. People often commented to me about how difficult it must have been to drive the Allard, which they assumed was a bad handling car. The people who made those comments had never driven that car so I always took them with a grain of salt. But it wasn't until I drove several other Allards and then the black number 14 that I realize how much minute care and preparation went into that particular car. It was a number of adjustments and modifications that were made that resulted in the handling characteristics of that car being far superior to any other Allard I ever drove. Tom Carstens, in fact, had won a championship in midgets so he was well equipped to set up a car. Tom Carstens and Dave Fogg, his partner, were a team that was hard if not impossible to beat. These days for a couple of hundred thousand dollars you can buy something from Italy, Germany or Great Britain that will go fast and is fun, but I will put up the Allard up against them. The Allard in terms of fun would be at the top.